Each week you can learn about your baby’s development, share amazing milestones, thoughts and photos, and manage all your to-dos as you count down to baby’s arrival. When it’s “go time,” you’ll find all the tools you need to count your contractions, notify family and friends, and get to the hospital. And once your baby is here, we’ll help you announce your baby’s arrival in style. 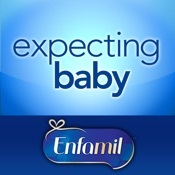 ExpectingBaby is brought to you by the maker of Enfamil®, a leading provider of science-based pediatric nutrition products dedicated to helping provide infants and children with the best start in life. NOTE: Compatible with iPhone, iPod touch and iPad. Requires iOS 3.0 or later.